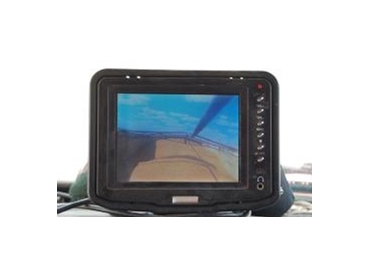 The vision from CW Imports Farm Camera Systems is enabling farmers to operate various farm implements efficiently and more importantly safely. Pictured is the view inside a semi tipper at harvest; the truck driver can now load his trailers safely from the truck seat and not clamber up and down the sides of the trailers checking on grain levels. The versatility of the CWI Farm Camera Systems in helping machinery operators obtain the maximum efficiency from their machines is now becoming apparent to many Australian farmers. It is a common statement that they are easy to use and install and it is no drama to take the screen and farm camera from machine to machine. January: Hooked up to the caravan/4WD for rear vision, while travelling and to make parking in caravan parks easier. Nov/Dec: In the harvester grain tank or chaser bin or Truck and trailers. As has been commented, it is great to have a tool that can be used in so many facets of the farm operation. With seeding time upon us, CWI farm camera systems have been installed in Air Seeder bins throughout Australia so as operators have a constant visual inside their grain tanks. This eliminates costly time wastage when changing varieties as the operator can see when the grain tank is empty, as well as ensuring that grain is always flowing. Farmers are also placing a camera on the middle of the bar that is hidden from view by the air tank. The new 7" screen can take input from 3 cameras as well as a DVD. Selection for each camera is as easy as a click on the remote control. With strong cables that have water and dust proof connections and cameras that work equally as well at night as in daylight these camera systems will pay for themselves quickly. Along with the recently introduced CWI lights with the Xenon HID System integrated in the lamp base, these products are meeting CW Imports philosophy of bringing quality items to Australian farmers to enhance their safety and profitability.